New Zealand has a varied climate and weather conditions throughout the year and even within a day. Although landscape is stunning New Zealand is prone to many natural events including lots of rain. How else does this country stay so green? But if your are planning to drive somewhere and it looks like it will be flooded, forget it. Previously we, at All About People have written about water safety and I would like to extend this topic to flooding due to recent natural events. As a Queenslander (yes, I can hear your compliments now) flash floods and flooding are regular occurrences due to the severe and wild weather we get during our storm season. We are taught from a young age to stay away from flood waters and it is reinforced later when obtaining a Driver’s Licence, and through advertising during storm season not to drive through flood waters. Recently we have had excessive rain in New Zealand across various locations such as Wellington in February (The Dominion Post, 2017), Arthurs Pass (Hayward, 2017) and Northland/Auckland the other week (TVNZ, 2017). Some of you may even recall the Police car that was washed away in Kawakawa Bay (Hurley, 2017). I also received many images from friends, of both themselves, and members of the public, driving through floodwaters causing me concern. Speaking to a colleague it could be summarised that Kiwis have a great understanding of how to deal with an earthquake but not flooding, where this would be the opposite for Australian. Did you know that over 50% of flood related deaths are attributable to driving through water. It only takes 15cm of water to make a small car unstable and 20cm to move it. 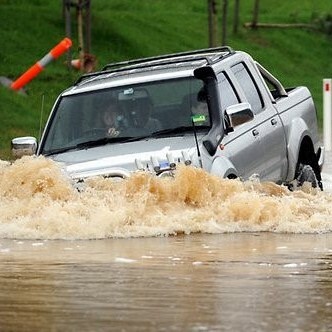 For a 4wd, only 45cm of water is required to make it unstable and 95cm to move it (Fogarty, 2016). Add a current to the equation and you can see why even small amounts of water can result in deathly results. If it is flooded, forget it. Perception that only depth of water matters and not speed. Australia can learn a lot from New Zealand with regards to Earthquake Management however, New Zealand can similarly learn a lot from Australia. So, the next time you come across a flooded road, forget it, and find another way to get to your destination. To plan for emergency situations in your organization call us on 0800 023789 or email info@allaboutpeople.co.nz.